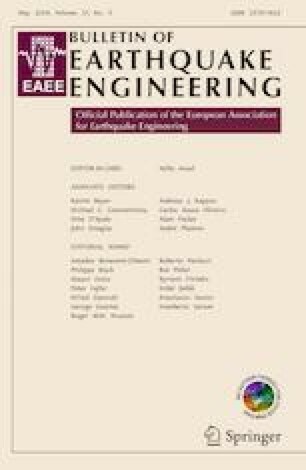 A review study is presented targeting the question how topographic amplification of strong earthquake ground motions is currently handled in literature and how this effect can be incorporated within earthquake loss estimation (ELE). An improved understanding of the phenomenon would also facilitate its inclusion in future building design code provisions in a more rigorous manner than present levels. Even though it is widely accepted that, in addition to soil conditions, surface topography can have considerable influence on the frequency and amplitude characteristics of earthquake ground motion, this effect has been neglected in all of the existing ELE software tools, and neither do ELE studies in general consider this effect. Therefore, after a detailed review of the existing literature, we have synthesized the results from some of the studies into a period-dependent topographic amplification relationship (including PGA) for sites at the top of a hill, which may be used in ELE studies. The relationship for an amplification factor, Ah, was obtained by fitting a database containing 333 data points, in which Ah ranges from 0.31 to 3.04, and the shape relief (H/L) ranges from 0.25 to 0.8. Out of these, seven data points correspond to topographic amplification of PGA while the remaining data points correspond to amplification of the spectral acceleration at periods ranging between 0.065 and 3.91 s. All the data stems from analytical/numerical studies and we have only considered the possibility of topographic amplification due to SV/SH waves with an incidence angle perpendicular to the base of the hill. The results show a reasonable correlation between the theoretical and the fitted data. We also have compared the amplification factors provided by our period-dependent relationships with the most recent experimental and numerical data for the Narni ridge (Italy) and found close similarities with these results. The proposed relationship can be used not only in ELE studies but also in simplified seismic microzonation studies. The authors wish to acknowledge Dr. Hilmar Bungum for fruitful comments on the manuscript that helped us to improve it and Marjorie Greene and Cletus Blum who made an extensive language and grammar review. The current study was conducted under the Indo-Norwegian collaboration project EQRisk funded by the Royal Norwegian Embassy to India (New Delhi) and the Spanish research projects BEST/2012/173, CGL2016-77688-R(AEI/FEDER,UE). The support received from these agencies is gratefully acknowledged.